CSS HOMEWARD BOUND POINTS OUT 5 MOST COMMON MISTAKES PEOPLE MAKE AND HOW YOU CAN AVOID THEM. Successful relocation is like running a small company and it requires careful planning, budgeting, and strategy. Overlook those factors as you may be looking at a recipe to avoid disaster. Relocation is a huge job and procrastination is your worst enemy. Even seemingly small moves, like moving a studio apartment across town, can be nerve-racking and costly if they’re not well planned. If you have the luxury of time, you should start planning your move months in advance. Start making travel arrangements, look into moving companies, pack, and get your financial and logistical affairs in order as early as possible. Start keeping a specific notebook or binder for moving-related information. Keep all your records in it, from copies of the moving estimate to restaurant suggestions in your new neighborhood. 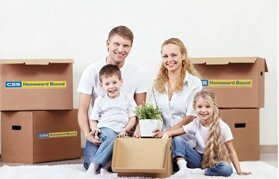 Timing is important: The summer months are typically the most hectic time of the year for moving companies. However, spring and autumn can get very busy, too. And remember that moving companies may not be available if you’re moving close to a holiday. If you’re planning to drive your own moving truck, make sure you schedule the rental well ahead of the day you actually need it. Find out the exact dimensions of the truck’s cargo space, and maybe even swing by the rental company to get an idea of the space you’ll require and whether a 13-foot truck is really up to the job. Research is critical here. Choosing the wrong moving company can mean stolen or damaged property, a move that is far more expensive and longer than originally quoted, and being overcharged for things like packing tape. And once all your stuff is in their truck, you’re in a terrible position to argue. Will they do an in-home estimate? Is their company going to be handling the move or are they going to hire a subcontractor? If they use a subcontractor, what are the name, location, and phone number of the company they’re hiring? Will this move require any special arrangements, like a transfer from the semi-truck to a smaller local truck to help navigate big-city streets? This may affect the cost of the move and increase the risk of damage to your belongings. Indiscriminately jamming everything you own into boxes might seem like the simplest way of packing, but it also guarantees needless stress and expense. Extra stuff equals extra weight, so you may end up overpaying your movers or overstressing your own back. Moving gives you a perfect opportunity to cull your possessions. Our Household Inventory worksheet and our Digital Locker tool can help here—make a detailed list of all of your belongings and you’ll be more able to see what’s truly essential. Also check out Allstate’s Ten Tips and Tricks to Improve Your Move for smart ideas about optimizing your move. Moving is tough on your stuff. Even if every item you own is carefully packed and handled by experienced movers, accidents happen. Get familiar with your insurance options before your move. Call your moving company to find out the details of its liability coverage policies. This coverage will either be based on the total weight of your items, the assessed value of your items, or the full value of replacement of your items. The good news is that if you have an Allstate Homeowners or Renters Insurance policy, your belongings are likely covered in the event of a moving mishap that occurs in transit.